Present study aims to explore the pathophysiological role of microRNA (miR)-29a in the process of obesity-related cardiomyopathy in human subjects and mice. The expression level of circulating exosomal miR-29a was measured in 37 lean and 30 obese human subjects, and correlated with cardiac parameters. The effects of miR-29a on mitochondrial activity and cardiac function were investigated by treatment of miR-29a sponge in primary mouse cardiomyocytes and diet-induced obesity-related cardiomyopathy in mice. The increased circulating miR-29a level was closely associated with impaired human cardiac function, including ejection fraction (r = −0.2663, p < 0.05) and NT-proBNP levels (r = 0.4270, p < 0.001). 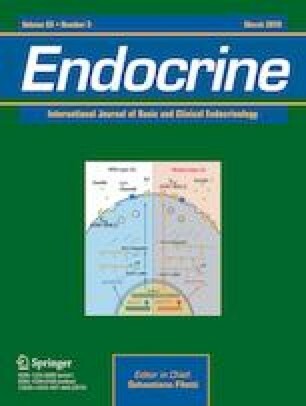 Exosomes from obese human plasma mediated cardiomyocyte mitochondrial inactivity, but pre-treatment with miR-29a sponge attenuated the exosomal miR-29a-induced reduction of ATP production (p < 0.001), basal oxygen consumption (p < 0.01) and mitochondrial complex I activity (p < 0.01). In vivo mouse study, high fat diet damaged cardiac function, normal structure, and mitochondrial activity, whereas miR-29a sponge improved the cardiac status. Present study uncovered the correlation between circulating miR-29a and cardiac parameters in human subjects, and provided solid evidence of the therapeutic application of miR-29a sponge in combating obesity-mediated cardiac dysfunction. These authors contributed equally: Fengqin Li, Kuikui Zhang. The online version of this article ( https://doi.org/10.1007/s12020-018-1753-7) contains supplementary material, which is available to authorized users. This study was supported by the match funding for the Key Laboratory of Myocardial Ischemia, Chinese Ministry Education (KL201316), The Heilongjiang Postdoctoral Fund (LBH-Z16133), and Chinese Postdoctoral Science Foundation (2017M611395). Procedures involving the clinical trial and animal experiments were approved by Human Ethics Committee and Animal Policy and Welfare of Harbin Medical University Committee.